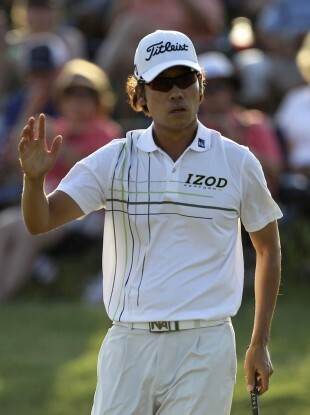 Kevin Na leads Matt Kuchar by one shot after three rounds of The Players Championship. KEVIN NA DIDN’T feel comfortable about anything on Saturday except his name atop the leaderboard at The Players Championship. Na rolled in a 15-foot birdie putt on the 18th hole for one of only three rounds without a bogey on a tough day at the TPC Sawgrass. It gave him a four-under 68 and a one-shot lead over Matt Kuchar as he goes after the richest prize on the PGA Tour — a five-year exemption and a spot in all the majors. For all his practice swings and waggles, even purposely missing the ball so he could start over, Na pieced together a brilliant round free of bogeys. He finished with two birdies on the last three holes to build a one-shot lead over Matt Kuchar, who hit into the water at the island-green 17th and had to settle for a 69. Rickie Fowler, coming off his first PGA Tour win last week at Quail Hollow, was dynamic as ever as he shot up the leaderboard. Fowler didn’t make a bogey until the last hole but still had the best score of the third round with a 66 and was two shots behind. He is trying to become the first player since David Duval in 1997 to win his first two PGA Tour titles in consecutive weeks. Texas Open champion Ben Curtis also played bogey-free. He just didn’t have as many birdies, missing from inside 10 feet on his last two holes for a 70. He was five shots behind, along with former Masters champion Zach Johnson (73). Tiger Woods never came close to getting into contention, though he gave himself plenty of chances. The card shows two birdies, two bogeys and a 72 that left him 10 shots out of the lead going into the final round. It was hard for him to digest. “I played well today and didn’t get anything out of that round,” Woods said. It was probably the most solid I’ve hit the golf ball all year, actually. Even though I hit a couple off line, they were just hit dead flush. I just got nothing out of the round. Kuchar went eight consecutive holes without a par — six birdies and two bogeys — to seize control on a windy day at Sawgrass. But he slightly missed on his tee shot at the par-3 17th and never came close to land. He did well to hit his third shot from the drop area to 5 feet to escape with bogey. Na managed to avoid them, and now tries to become the first 54-hole leader to win The Players Championship since the tournament moved to May. Email “Na takes narrow lead into the final day at Sawgrass”. Feedback on “Na takes narrow lead into the final day at Sawgrass”.